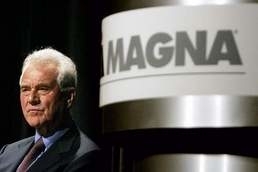 TORONTO (Bloomberg) -- Magna International Inc., Canada's largest auto parts supplier, will eliminate its dual-class structure and end founder Frank Stronach's control of the company after shareholders approved a reorganization plan. Shareholders accepted the plan with about 93 percent of the votes cast at a special meeting in Toronto, Magna said Friday. The Aurora, Ontario,-based company said about 75 percent of Class A shares voted were in support. The plan is subject to court approval at a hearing Aug. 12 and 13. The deal gives the Stronach Trust, controlled by Stronach, $970 million in cash and shares based on Friday's closing price on the New York Stock Exchange in return for ceding control of the company he founded in 1969. Stronach, 77, did not attend the meeting. A majority of shareholders voted that this is “a good deal,” Mike Harris, a board member and chairman of the meeting, told reporters as he left the venue. He declined to stay after the meeting and answer questions. Magna's stock has jumped 47 percent this year. While it was opposed by the Canada Pension Plan Investment Board, which said the payout is excessive, Magna Chief Financial Officer Vince Galifi said getting rid of the dual-class system will eliminate the discount at which companies with multiple- share structures trade. The Ontario Teachers' Pension Plan cast its vote against the deal and said today in a statement it will join other shareholders to oppose it at the Ontario Superior Court of Justice hearing next month. The pension fund holds one Magna share. “The proposed arrangement is excessive, unprecedented and unfair to shareholders,” the fund said in an e-mailed statement. The proposal was developed by a committee of independent directors. It calls for the Stronach Trust to get 9 million new Class A shares, or a 7.4 percent stake, for the Class B stock that now gives it about 66 percent of voting rights. The trust would also receive about $300 million in cash. All Class B shareholders were represented at the meeting and all voted for approval at 300 votes per share. About 80 percent of Class A shareholders were represented. Magna will establish a joint venture with the trust to develop electric vehicles and end a consulting arrangement with Stronach. Magna, based in suburban Toronto, ranks No. 5 on the Automotive News Europe list of the top 100 global suppliers, with sales to automakers of $17.37 billion in 2009.